Lakeville North continues to prove that anything is possible with great goaltending -- including advancing to the state tournament. For the second consecutive year in the Section 1AA championship game, the Panthers upset Lakeville South thanks to another stellar performance by junior goaltender Charlie Lindgren. "It was a game where everything went my way and it was probably the most fun game I've ever played in," Lindgren said following Lakeville North’s 2-1, triple overtime victory. During 76 minutes, 25 seconds of nerve-wracking game time, Lindgren made 51 saves for the Panthers. Not necessarily a high-scoring team, Lakeville North netted a total of 100 goals in the regular season and section tournament. 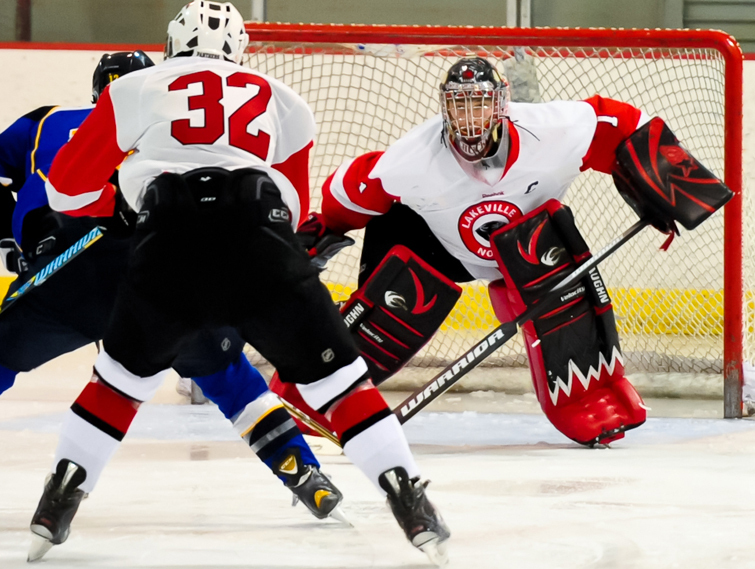 However, the Panthers have shown their offense kicks things up a notch when their goaltender is red hot. 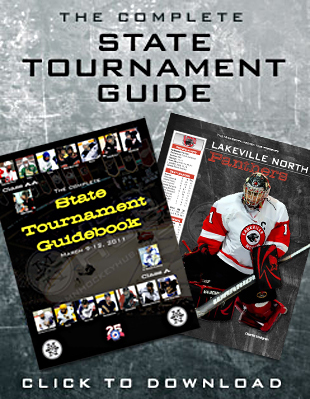 Lakeville North’s effort advances the team to its third state tournament appearance -- the Panthers also participated in the 2006 and 2010 tournaments. While advancing to the state tournament is always a major accomplishment, Lakeville North has historically struggled once there with an all-time record of 0-4-0. 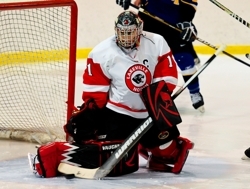 Surrendering a total of 21 goals in those four tournament losses, Lakeville North’s fate in 2011 is likely to fall onto the shoulders of Lindgren who has posted an 11-9-1 record (2.85 GAA, .914 save percentage). Leading the Panthers’ offense are junior forwards Blake Winiecki (25-25-50) and Charlie Hayes (15-12-27) as well as senior Ben Counters (18-8-26). Only one defenseman -- senior Shaun Reinhardt (2-13-15) -- is in double digits in points. Lakeville North will meet top-seeded Eden Prairie in the quarterfinals at 6 p.m. Thursday, March 10, at the Xcel Energy Center in St. Paul. Regardless of the game’s outcome, Schmitz expressed the main goal of the week is to ensure the players have a positive experience. 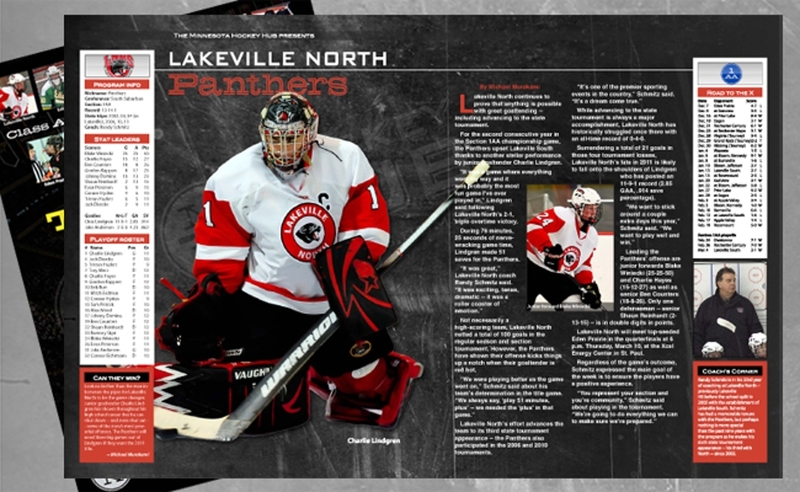 Look no farther than the man in-between the pipes for Lakeville North to be the game changer. Junior goaltender Charlie Lindgren has shown throughout his high school career that he can shut down -- and even shut out -- some of the state’s most powerful offenses. The Panthers will need three big games out of Lindgren if they want the 2011 title. Randy Schmitz is in his 23rd year of coaching at Lakeville North -- previously Lakeville HS before the school split in 2005 with the establishment of Lakeville South. Schmitz has had a memorable tenure with the Panthers, but perhaps nothing is more special than the past nine years with the program as he makes his sixth state tournament appearance -- his third with North -- since 2002. Lakeville North's players certainly have done their job on the way to the Class 2A tournament, but the Panthers' coaching staff has played an equally important role. And they have a veteran man leading the way. Randy Schmitz has taken six Lakeville hockey teams to state: three in a row from 2002-04 when it was a one-school team, and with Lakeville North in 2006, 2010 and 2011. The feeling of making it to state never gets old, and regardless of the opponents the job of Schmitz and all coaches is to prepare players for the challenge. But this is the second consecutive year the Panthers have faced a monumental task. Last year's team drew top-seed Minnetonka and lost 6-1 in the opening round. This year? The unseeded Panthers (13-14-1) again drew the toughest opponent, getting No. 1 seed Eden Prairie (21-5-2) in the quarterfinals. The game is scheduled for 6 p.m. Thursday at Xcel Energy Center. "The team is feeling great," Schmitz said. "Really excited and thrilled to again achieve one of their dreams of playing in the state hockey tournament." Lakeville North won the Section 1 tournament by defeating cross-town rival Lakeville South 2-1 in triple overtime last week. Junior Blake Winiecki's goal 25 seconds into the third extra session -- his second of the game -- was the difference. He led the team with 42 points during the regular season. There aren't any superstars on the Panthers' roster, but role players Charlie Hayes, Ben Counters, Gordon Kappers and Johnny Domina all made a difference with at least 20 points this season. "They've done their jobs very, very well," Schmitz said. "The team concept thing has been huge for us. And all of our players know that." The Panthers are backstopped by Charlie Lindgren, a Star Tribune All-Metro third team selection, and have the experience to possibly pull an upset. It can be done; North lost both games to South during the regular season by a combined 13-3 before the section final turnaround. "Working as hard as they did and then finally getting that win naturally boosts their confidence," Schmitz said. "But we know Eden Prairie is an outstanding team. We're going to have to play very well for good things to happen. The competition is too great to make mistakes." Eagan advanced to its second state tournament ever by defeating South Suburban Conference rival Apple Valley 1-0 in the Section 3 final. Kyle Bonstrom's third period goal and the shutout performance of Tommy Bodeker lifted the Wildcats (17-6-2) back to state. They made state for the first time in 2006. In the return trip, Eagan kicks things off at 8 p.m. Thursday against Moorhead (18-7-2).